We love puzzles and games so we jumped at the chance to try the Solar System FlipStir Puzzle from Enlivenze LLC. 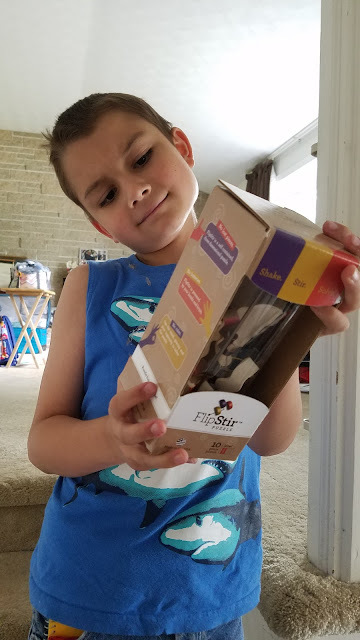 The FlipStir puzzle is a 3D puzzle that is self contained. It is basically a jar with a puzzle in it and you need to shake, stir, and solve the puzzle using a wand in the jar. It is suggested for ages 7 and up, but my two-year-old also had fun playing with it (not that he would ever manage to solve it at his age). They have two levels of puzzles. Level one includes Rainbow Pencils and Tyrannosaurus Rex. Level Two includes Statue of Liberty, Solar System, and the Periodic Table of Elements. The difference between the levels is the shape of the pieces. Level one pieces are rectangular while the level two pieces are wavy. What did we do with ours? I kept our Solar System puzzle in the car. The kids could play with it on trips or when we were visiting some family. My nine-year-old son had fun with it, but it was my husband that ended up being the first one to solve the puzzle. I still keep the puzzle in the car because the kids like to take turns at it. Sebastian, checking out the new puzzle. My son and husband love puzzles. My husband typically receives some sort of puzzle from his parents each year at Christmas and he tends to solve them in a matter of minutes. This one took him a little longer, but in the end he managed to solve it. He took a picture when he solved it, but I can't tell you where he was. I don't recognize the background, lol! You can buy these puzzles online for $24.99. You can also find them at select stores. Search for your state online and visit in person!